Rupert Goold’s adaptation of Mike Finkel’s true crime novel/memoir, True Story is tepid that serves as a sobering reminder that while truth can be stranger than fiction, that’s not enough to make it interesting. At its core it is a genuinely bromance, but that conceit is soft-pedaled and ignored in favor of anemic characterization. Jonah Hill stars as Finkel, a promising reporter for the New York Times whose rising star plummets to earth spectacularly when it is revealed that he fudged the details of a story on young Africans selling themselves into slavery. Ashamed and saddled with a poisoned reputation, Finkel retires to his remote mid-Western home with his wife, Jill (Felicity Jones) to eat his heart out and repair his career. Unexpectedly, he receives a call from a reporter in Oregon seeking his comments in regard to Chris Longo (James Franco), a man accused of murdering his wife and their three children, recently captured in Mexico where he had been using Finkel’s identity as an alias. 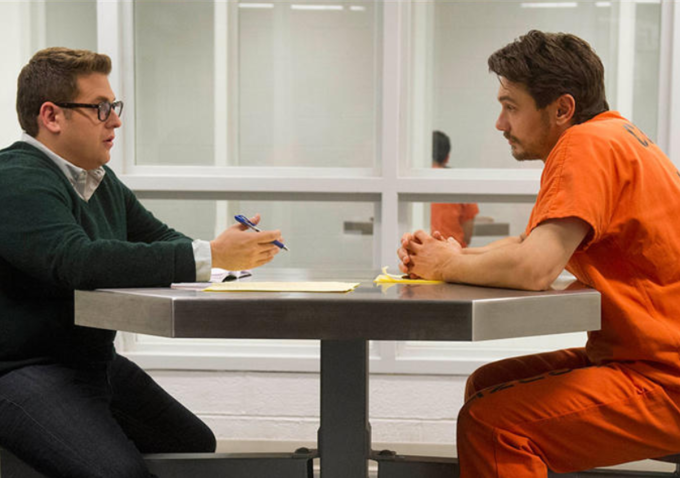 Finkel, desperate and vulnerable, meets with Chris, who claims he is innocent and strikes a bargain with Finkel: He’ll let him tell his story and cover his trial (and hopefully prove his innocence) if Finkel will teach him how to write. It’s this oddest-of-odd-couples relationship that drives the movie, but unfortunately it never really gels. Both of the lead characters are thinly written, and Hill’s nice guy shtick and Franco’s omnipresent smarminess aren’t enough to flesh them out. Neither character displays much that makes them sympathetic or even relatable; Longo is an overconfident narcissist, and Finkel is a self-absorbed tool who makes so many boneheaded choices as a professional journalist that it’s a head-scratcher as to why the Times ever hired him. Lurking in the background is the intriguing notion that both men are exploiting one another for their own gain, but that is surprisingly overlooked. What we are left with is Finding Forrester meets The Silence of the Lambs, as filtered through an ’80s-era network TV movie-of-the-week. What ultimately hamstrings the movie is its lack of heart. Much of the mercifully short film consists of Finkel and Longo sitting opposite one another in prison, indulging in mutual appreciation and ingratiating. Their dialogue is stale, their personal revelations are shallow, and both men quickly grow tiresome. Finkel and Goold failed to heed one of the first tenets taught in journalism school: never make yourself part of the story — if for no other reason than to avoid boring your audience to death.